Top Notch Infotronix, India’s leading supplier of products and accessories for Computers, Consumer Electronics and Communication under the brand ‘ZEBRONICS', has extended its line-up of speakers in the Sound Monster range with its latest model - ZEB-T7400RUCF Tower Speaker system. Dubbed ‘Bring Home the Party, – the new speaker is housed in full wooden enclosures for a base-heavy immersive music experience. The high-gloss piano black front panel and chrome trims gives it an elegant look, while a natural wood finish on the box would complement the décor of any living room or bedroom. The speaker system is designed such that it can be positioned anywhere in the room for 60 watts (RMS) of full, three-dimensional concert hall sound and become the centre of attention at any family occasion, providing a DJ ambience. Audiophiles will love the high quality sound coupled with multiple functionality that includes dual-mic karaoke function (wireless microphone is part of the package). Dual 8-inch drivers for low range, 4-inch drivers for mid range and 1.5-inch dome tweeters for higher frequency provide room filling sound. The drivers’ inherent stiffness, low mass and self-damping properties allow them to deliver clean, accurate sound. Side volume controls, woofers, front ports with LED display all come in superior chrome finish. In addition, input ports on the side provide the capability to connect the sound source any digital device such as phones or media players via standard accessory cable. A memory card slot and USB port provides capability to play audio directly from SD/MMC cards or USB flash device. A built in FM radio receiver and a full-function remote controller complete the system. Whether using it as a standalone music system, or to accessories media player or to complement a large-screen TV, the feature-rich Zebronics Sound Monster ZEB-T7400RUCF brings a new level of affordable performance (and bling) to the tower speaker market. 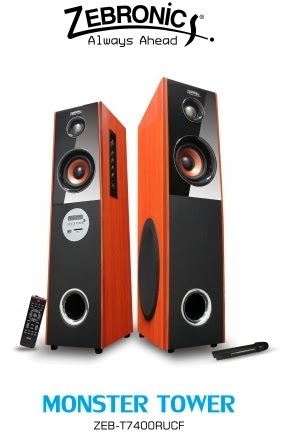 The Zebronics Tower speakers ZEB-T7400RUCF is priced at Rs. 6600/-, which includes a warranty 1 year warranty. It is available at major IT accessories markets; retail IT outlets as well as Zebronics e-commerce site www.moneyvasool.com.